The Westpac Lifesaver Rescue Helicopter at Harmony Primary School on Tuesday. 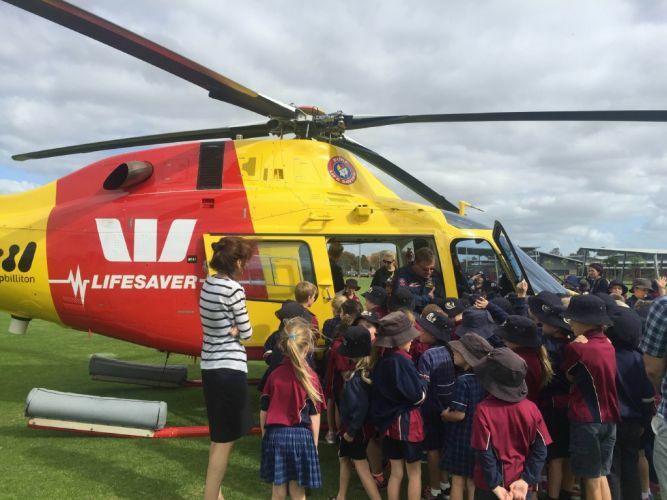 IT is most commonly seen patrolling the coastline between Yanchep and Mandurah, but the Westpac Lifesaver Rescue Helicopter touched down at Harmony Primary School for a special visit last week. The chopper landed on the oval last Tuesday morning as reward for the Atwell-based school completing the Lifesaver Rescue Helicopter School Program. The program teaches students about the importance of not-for-profit services to the local community. Harmony Primary School was chosen from more than 3000 schools across the country taking part in the program.